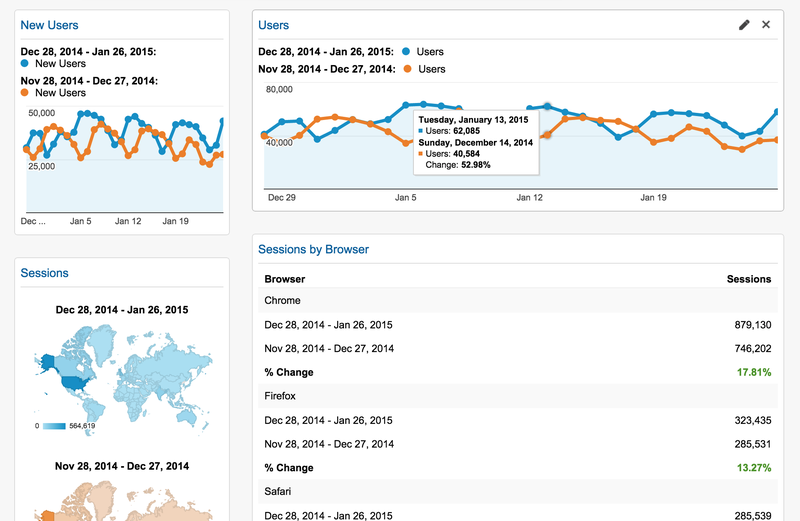 Google Analytics is a free service that offers a complementary view of your traffic to our built-in Stats feature. For example, funnel reports help you track the path visitors take through your site, and goal conversion lets you measure how visitors complete specific tasks (such as reaching a product page or contact form). You can add many different sites to Google Analytics and view reports about them in a unified dashboard, making it very easy to see how all your projects are doing. To get started, sign up for Google Analytics and create a new “property” to collect data for — this will be your WordPress.com site. A Tracking ID will be issued, looking something like UA-123456-12. Back on WordPress.com, navigate to the My Sites screen and choose a site with WordPress.com Business. Go to Settings → Analytics and enter the Tracking ID issued earlier by Google Analytics. When you save the changes, your site will be connected to Google Analytics and start sending data to Google. It could take a few hours before this data starts showing up in your reports on Google Analytics. See our support section for more information about using Google Analytics on WordPress.com. Google Analytics is now available for all sites with the WordPress.com Business plan. Check out our plans. This is excellent, and welcome, and I’ve been a Business Plan user for a long while now — yet I don’t see an Analytics setting in my Admin area. Please advise! Hmm. Just found the setting under the “new” backend design that I don’t use. Any plans to add this to the old skool admin area? No plans to put any new features into the wp-admin dashboard, beyond what comes from core updates from the open source side. Implementation of Google Analytics is fantastic, however it would be a lot better to have it for everyone and every website for free due to the fact that Analytics is a free service with the power to monitor everything. Thus helping greatly to make our blogs better. Love Google Analytics! PLEASE tell me you’re planning to make this available to those of us that aren’t on the “Business” plan. Advanced analytics like those from Google is only planned for the Business plan, but we are planning to add other features to the premium and free tiers this year that we think are going to make them a lot more compelling. Is there a reason why this only will be available for business accounts? Sure: Because analytics are most frequently needed by more advanced or business users, and it also makes the business plan more valuable for its users, or compelling for someone to upgrade to it. What’s the benefit for me by Google Analytics on wordpress.com? As the post talks about, Google Analytics provide an alternative view of your statistics and visitors that you might find interesting, or give you more insights into your audience. Is PREMIUM not enough to get Google Analytics? The Premium plan does not include support for Google Analytics at this time, but look forward to more news regarding our plans in 2015. Great news. I hope in the future we will have more integrations with other tolls. For example, I just do not understand why we can not have a forum in our blogs using bbPress, or using Muut (that has a great wordpress plugin). Why only for the business plan? With the amount of users requesting this feature almost daily in the forums I would have thought it worthwhile to make it available for all sites. Welp, it isn’t working. Enabled it on the Google side right after posting my first comment and nothing is showing up in Google Analytics a day later. How do I know if this is properly set up on the WP.com site? I have no way of checking. Someone from support will be in touch with you — since you’re a business subscriber in the future you can also ask via the live chat feature. Thanks for the reply. I’m not sure what you mean by “Open Source Side” and “core updates” and how that works with my WordPress.com Business hosting. Is the wp-admin area no longer part of WordPress.com hosting and it won’t be getting any more updates? Should I stop using it? Is there any way for users to make the new ‘backend’ admin are less blue? No worries! WordPress.com is based on open source software developed at WordPress.org and that does major updates about 3 times a year that we port over. You don’t have to stop using wp-admin, and it’s not going anywhere, it’s just not where we’re focusing our energy right now. As you’ve probably noticed, most of our new updates and iterations are happening in the new interface. You’ll see lots of improvements there in the coming months. There’s no way built-in to change colors right now, but if you’re feeling fancy and like writing CSS you could try out an extension like Stylish for Chrome or Greasemonkey for Firefox. Thanks for taking the time to explain this to me. I’ve been cautiously watching the new look vs. the older backend — and until now, it didn’t seem to matter if I moved to the improved interface or not. Now I understand the newest stuff, like Google Analytics, will appear first in the enhanced area, and I need to move over! SMILE! I will check out the extensions you mention! I live 20 hours a day in Chrome for Mac! I am happy to see you here, Matt. I´m in the premium plan but if we have more integrations and a forum feature in the business plan I´ll change to this plan. Ive been hesitant to use google analytics but now I see that it will help me with my blogging more in a more detailed manner. Thank you for this post. It was very informative and helpful. haha, very good! looking at those stats made me laugh – because i was being so proud of my 29 views the other day 😀 interesting read, thanks for sharing! WOW! as a new member to the worldpress.com world this will make for some very interesting reading, thank you! This is good news! Now no need to enable Google Analytics using CloudFlare Apps. Thanks WordPress team.